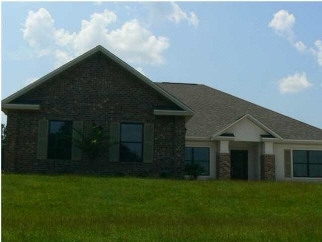 Description: Gorgeous new 4br/3ba home in lake ridge estates!! Beautiful home in a spacious neighborhood, lake ridge estates. Natural beauty abounds in this community. Enjoy the magnificent lake and the relaxed atmosphere. It's countryside living close to churches, schools, grocery, banks. Spacious two car garage. Living/kitchen area has beautiful trey ceiling, and the dining room also has trey ceiling. The kitchen features a center island as well as a breakfast area. The mbr features a trey ceiling, porch access, walk-in closet, large master bath w/ tub and separate shower, double vanities. Built by 2011 parade of homes winner, core construction.